Leaping lizards! It looks like a real frog and has stretchable legs just like one too. 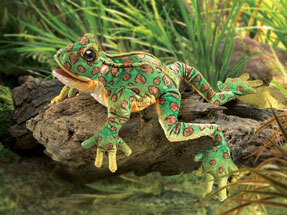 The Leopard Frog is fashioned in soft micro-fiber fabrics and features a movable mouth and front legs. Measures 15" long x 8" wide x 4" tall.